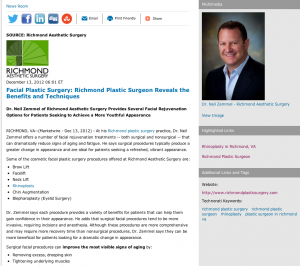 Richmond, VA–At his Richmond plastic surgery practice, Dr. Neil Zemmel offers a number of facial rejuvenation treatments – both surgical and nonsurgical – that can dramatically reduce signs of aging and fatigue. He says surgical procedures typically produce a greater change in appearance and are ideal for patients seeking a refreshed, vibrant appearance. Dr. Zemmel says each procedure provides a variety of benefits for patients that can help them gain confidence in their appearance. He adds that surgical facial procedures tend to be more invasive, requiring incisions and anesthesia. Although these procedures are more comprehensive and may require more recovery time than nonsurgical procedures, Dr. Zemmel says they can be more beneficial for patients looking for a dramatic change in appearance. Dr. Zemmel notes that surgical facial procedures offer patients a more aggressive, permanent solution to “turn back the clock.” The plastic surgeon in Richmond uses modern and advanced techniques to give patients the most natural-looking results. Whether patients opt for surgical or nonsurgical facial rejuvenation procedures, Dr. Zemmel provides each patient with a customized treatment plan to help them reach their aesthetic goals. Dr. Neil Zemmel is a board-certified plastic surgeon who graduated from the College of William and Mary in Williamsburg. He earned his medical degree from the University of Virginia School of Medicine and the Virginia Commonwealth University Medical Center. Dr. Zemmel currently serves as a Diplomate of the American Board of Plastic Surgery and is the Director of Plastic Surgery Services at St. Francis Hospital. He is available for interview upon request.